The only way Russia-U.S. relations will really improve is if the reset is broadened beyond politics to include other areas of cooperation. In Russia, optimism rarely takes hold. Perhaps this has something to do with the cold climate or with the country’s complicated history. Optimism here is usually frowned upon as a sign either of political bias or lack of intellect. Pessimism, on the contrary, is perceived as a sign of intellectual acuity and independent judgment. As soon as the Russian-American Reset produced its initial results, the voices of a few enthusiasts were drowned out by a chorus of skeptics. Newspapers and TV screens were full of warnings to avoid euphoria, not to expect too much from a thaw between Moscow and Washington and to focus on the fundamental differences in their positions on many matters of principle. 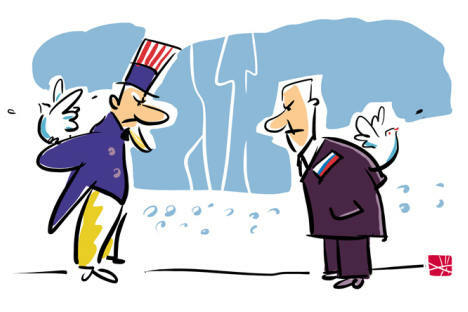 Likewise, Russians are urged not to entertain illusions about the outlook for cooperation between Russia and the United States during 2012 – a year that will be critical politically for both countries. This skepticism is shared by talking heads from across the Russian political spectrum. Those who identify themselves as Russian patriots believe that hoping for partnership with the U.S. shows a total lack of common sense, because the American leadership has always been and will always be hostile to Russia, no matter who sits in the White House. The liberals are pessimistic for another reason. They think the Kremlin is simply not ready for a serious dialogue with the United States, and it still plugs the line about a “hostile external environment” to distract its populace. Both points of view need to be taken into account. Without going into the intricacies of this polemic, it is safe to say that the negativity in Russian-American relations is still running high. As a result, even the mini crises that have occurred recently in bilateral relations could well have developed into a serious confrontation. The situation today is even more complicated than during the Cold War. At least during that time, Moscow and Washington had a mechanism for bilateral negotiations and the relationship was based on principles understood by both sides. That foundation has now been destroyed, while, unfortunately, no new one has emerged. The attempts to create a new foundation for relations in the form of multi-functional intergovernmental structures such as the Gore-Chernomyrdin Commission and the Medvedev-Obama presidential commission have hardly been a success. They have failed to create a multi-tiered foundation for relations. Russia accounts for less than 1 percent of the United States’ foreign trade, while the U.S. share of Russian foreign trade is less than 4 percent. With no economic foundation, bilateral relations still depend on fluctuations in the political situation. Even the New START treaty, the unquestioned achievement of the reset, is in jeopardy. But even if Moscow and Washington fail to come to terms on missile defense, there will not be a new Cold War because neither the White House nor the Kremlin are interested in that happening. A new arms race between Russia and the U.S. is highly unlikely, considering their budget deficits, economic and other national security problems not directly related to their strategic nuclear arsenals. Yet lack of progress on anti-ballistic missiles is a serious matter. Strategic interaction is the litmus test of the state of relations between our two countries. There are influential forces in both countries that have never really believed in the "reset" and have, over the last three years, been waiting for the trend to reverse, using every opportunity to try to bring the relations between Moscow and Washington back to what to them is business as usual. The failure to reach a compromise on anti-ballistic missiles is a signal to all skeptics, all conservatives and potential Cold Warriors that their time is back, that, at the end of the day, nothing can be changed in the relations between Moscow and Washington and that our countries are doomed to eternal confrontation. The only way to prevent this scenario from materializing is a broadening of relations. Apart from traditional security issues, there are many areas for joint cooperation, from energy policy to innovation, from education and to reforming the system of international organizations. On these levels, the reset has been a failure. The past three years have seen no breakthroughs in Russian-American economic and humanitarian links and no dialogue has been established between the representatives of civil society. Regardless of how Russians feel about Americans, it is clear that for the foreseeable future, the United States will factor in any Russian foreign policy area of significance. On global security and international law, regional stability and the stability of the world currency and financial system, counter-terrorism and nuclear non-proliferation, food security and climate change, we will have to interact with the Americans. Even if we decide to fence ourselves off from Washington and focus on promoting relations with our close neighbors – the CIS members, China, the European Union – we would still come up against the U.S. at every step. Washington, too, will find it much more difficult to resolve matters of concern without partnership relations with Russia. Antonio Gramsci proposed a wonderful formula: “pessimism of reason and optimism of will.” Only political will on both sides can reverse the new negative dynamic in Russian-American relations, but in this case political leadership is clearly not sufficient. What is needed is coordinated and steadfast efforts by politicians, businessmen, journalists and experts. Only if we act together can we build a relationship that is worthy of our two great countries. This is not the time for a clash of egos or settling of accounts. The stakes are too high. Igor S. Ivanov is President of the Russian Council on International Affairs. From 1998 to 2004 he served as Russia’s foreign minister. In 2004 he took the position of Secretary at Russia's Security Council. He particpated in several UN General Assembly sessions and also served as Russia's ambassador to Spain.